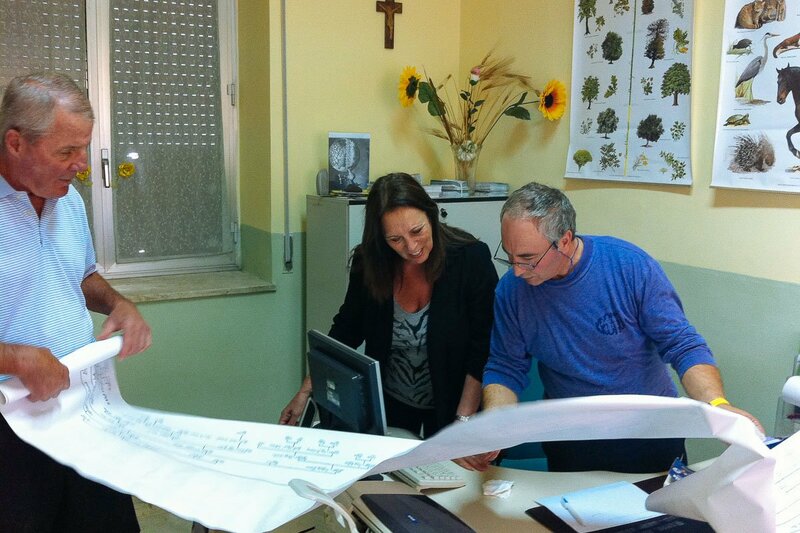 With the help of her family tree, an American tracks down her relatives in Sicily. All photos by Lisa Parrish. A writer sets off on a mission to find long-lost relatives in Sicily. Where there's a will, and ancestry.com, there's a way. I have always been curious about my heritage. Now with resources like ancestry.com and TV shows like Who Do you Think You Are, we have the tools and inspiration to unravel masses of information about our ancestors. It seems more than ever people are traveling to explore their roots, and my family and I did just that, twice. Last year I wrote a story for Gentedimontagna about an unforgettable voyage through Europe with my parents. Part of that trip was a mission to seek out distant relatives in a tiny village in Southern Germany where my father's great-grandfather, Gustave Geiger, was born. Gustave had made the journey to America, specifically to Ohio, where he would raise his family and where, eventually, I would grow up. It was an extraordinary series of events, starting in the tiny German village of Neuburg when we met a woman in a church cemetery who happened to know a couple with the last name Geiger. She took us to their home in the adjacent village of Lauterach. That couple had the same family tree document we did. They were our cousins. It was incredible. To this day, we talk about it as though it is the first time we are telling the story, full of surprise, excitement, and smiles, as if we still can't believe it really happened. So we thought we would try it again. This time it was Mom's turn. Sicily! My mother was raised in Cuyahoga County, Cleveland, Ohio, by her parents, Peter and Theresa Neuter. Theresa's maiden name was Amato, changed from Amata when her father, Rosario Amata, came to America from Naples in 1908 when he was 24 on the Moltke ship. Rosario was married to Teresa Sancetta, both of whom were born in Militello di Rosmarino, a tiny mountaintop village in the province of Messina on the northern coast of Sicily. 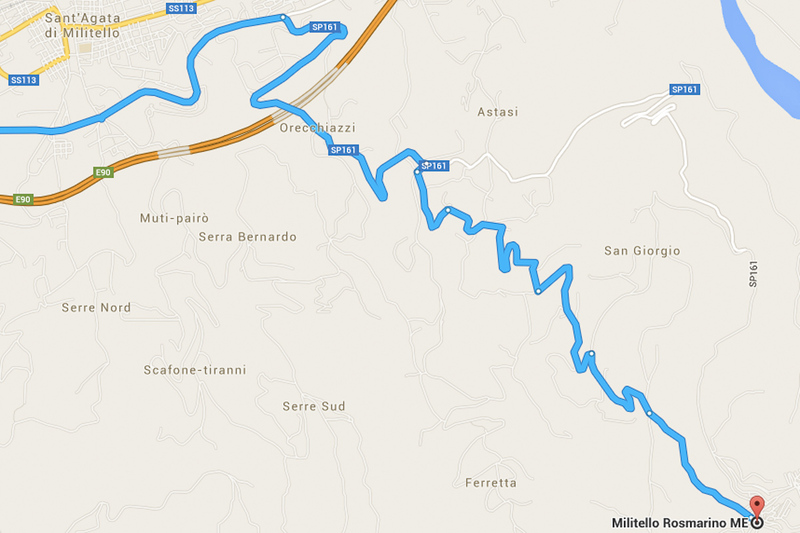 My mother always dreamt of going to Militello to walk on the land of her family seat, and it was time. We planned an ambitious trip through Italy, the most important part of which was a trek up a mountain to a little Sicilian village to see what we might find. We ate pasta every day, drank wine at every meal, and roamed our way through Florence, Tuscany, Positano, Pompeii, and finally, Sicily. Once in Sicily, we spent a few days in Palermo and, on a sunny Tuesday morning in early October, we got into the car, triple-checked our seat belts (if you have never driven in Sicily, you are in for quite a ride, and I will leave it at that), and set off for Militello di Rosmarino. We did not have as much to go on as we did on our German adventure, but my parents had spent a lot of time on ancestry.com and were able to map out pieces of the family trees of Rosario Amata and Teresa Sancetta, which we had documented on a sheet of paper. X marks the spot on the journey to track down family in Sicily. We were also fortunate to have the help of my grandmother's sister, my great-aunt Joanne (Josephine), who is 93, living in Cleveland, and the only one left of Rosario and Teresa's seven children. She gave us some context about her parents — how Rosario spotted Teresa one day in the village and told his friend that he thought she was beautiful. It seemed strange to us they wouldn't have known each other in such a small village, but because Rosario's family lived on a farm out of town, they didn't officially meet until they had both migrated to Cleveland, where they fell in love and married. We drove along the freeway for about two hours — through tunnel after tunnel, the Mediterranean Sea our as northern border on our left and a mix of green and brown mountainous terrain to our right. It was a quiet and peaceful drive for the most part. We had an in-car GPS, two iPhones with GPS, and two old-school paper maps. This was not an easy place to find, but our navigation systems came through, and we started to see signs indicating we were getting close. We were excited and anxious about what might happen. I was a little nervous for my mother. The Germany experience had unfolded so incredibly, that the bar was set pretty high. She might be disappointed if we did not find any relatives. But what were the chances? We found ourselves at the bottom of the mountain in our little Fiat rental. What I did not know at the time was the voyage we were about to make up the mountain in this little car was going to be daunting, to put it mildly. My father knew — and wisely did not tell us. I was looking at the GPS on my phone trying to guide him turn by turn. I figured out that day why a hairpin turn is called a hairpin turn. I thought my GPS was joking. It looked like a child's scribble: No way could it really be this tight going up and up and up. My original enthusiasm dissipated quickly as the intensity of the turns continued for fifteen minutes that seemed like five hours. I was sweating. My father was focused, careful, and confident. We finally made it to the top, with three massive sighs of relief. The excitement returned even more powerfully than before. I had butterflies in my stomach. We were almost there. It was now early afternoon and the weather was pleasant, sunny, and warm, but not hot. We parked the car and embarked on our mission. The first thing that met my eyes was a beautiful, rustic off-white church with one open door. We went in to find it completely empty of people but adorned with gorgeous Renaissance-style paintings and large beautiful flower bouquets. When we went back outside, we noticed rice on the steps and thought there might have been a recent wedding. I had visions of what such a celebratory event would have been like at this glorious church, but now everything was quiet and no one was around. Aunt Joanne had told us that her mother lived across the street from the church, so we gazed upon the few houses wondering which was Teresa Sancetta's house. We walked around the silent narrow streets and came upon a little cafe, not very glamorous, more of a coffee shop with a few Italian liqueurs and lotto machines. The first person we saw was a robust man with a white apron standing near the entrance, who we thought might be the owner. My dad just came right out and said "Amata" hoping the man might know someone in the village with that name. He told us "un minuto" and walked through the back of the café into a courtyard where there seemed to be a serious card game going on. He returned with a young man in his 20s who spoke a little English. My father repeated "Amata," and to our surprise, the young man pointed to himself and replied, "I am Amata! Where are you from?" "The U.S.," my father answered. "Are you from Cleveland?" he replied. Our jaws dropped. He explained he had family in Cleveland and, while we did not recognize the names he mentioned, we knew there was a good chance it was the same Amata clan. (Ours is a massive family.) Besides, he was the spitting image of my mother's cousin, Jimmy Amato. This was a great start. The first person we met in the town led us to an Amata, with family in Cleveland. Feeling lucky, we then asked the café owner if he knew anyone with the name "Sancetta" to see if we could uncover any clues about my great-grandmother's side of the family. He gestured as if he was going to make a phone call and explained we should come back in 20 minutes. We were a little confused, but knew from experience to be patient and do what they said — or at least what we thought they said. In the meantime, we strolled around and I felt the eerie, pleasant sensation of our ancestors around us. I thought about my great-grandparents running around the village when they were little and what their lives must have been like. I was so curious about the events that had led them to America and then to Ohio where they raised a big Italian family. We came upon a little yard where a monument stood proudly, etched with names of soldiers who had come from the town. On this monument we saw the name Cangemi, the name of my Aunt Joanne's late husband, whose family also came from Militello. Twenty minutes flew by and we made our way back to the café. The owner pointed to a building off the courtyard, directing us, sort of pointing, and flipping his hand in a motion to go ahead. We were overcome with curiosity at this point wondering whom he had called and what we would find in this building as an answer to our question about the Sancetta family. We stood in front of the building and after a few minutes, a cute man with a glint and a smile in his eyes walked up, unlocked a door, and led us into an office inside the building. On the walls were posters of various plants and animals. I noticed brochures that read Ente Parco Dei Nebrodi, which we later learned is a major park nearby. As we stood there staring at the man, wondering who he was, he introduced himself as Charlie…Sancetta! The three of us looked at each other in shock. He sat down behind the desk and opened one of the filing cabinets. Before we knew it, he unfolded an elaborate family tree, a scroll of names and dates that went on forever. At the top of this endless document in old-style Italian handwriting was written "La Famiglia Sancetta di Militello Rosmarino, Sicily." We spent a few minutes perusing and had just skimmed the surface when my mother and Charlie engaged in a discussion about their families. Somehow, despite the language barrier, we discovered that Charlie's ancestors had migrated to Cuyahoga County at the same time as my great-grandmother Teresa. We couldn't believe that in less than one hour we were sitting with a possible relative. A few minutes later, my mother explained to Charlie that her grandfather was Rosario Amata. Upon hearing this, he responded, "Oh, Amata! Andiamo!," so we left his office and followed him down a winding road, eager to see what would happen next. He knocked on a door. A woman opened it and invited us in after she and Charlie exchanged a few words. As we were trying to figure out where we were, Charlie looked at the woman and pointed to my mom and said "Amata." Her eyes widened with surprise. She looked at the little piece of paper we had brought with our family tree. When she glanced over Rosario Amata's name, she stopped, gasped with joy, threw her hand to her chest, and started hugging my mother. I was starting to enjoy this hybrid feeling of excitement and confusion. We discovered that, because her husband is an Amata, there could be a link between her family and ours. An overwhelming joy and an incredibly powerful energy seemed to connect everyone in the room at the same moment. 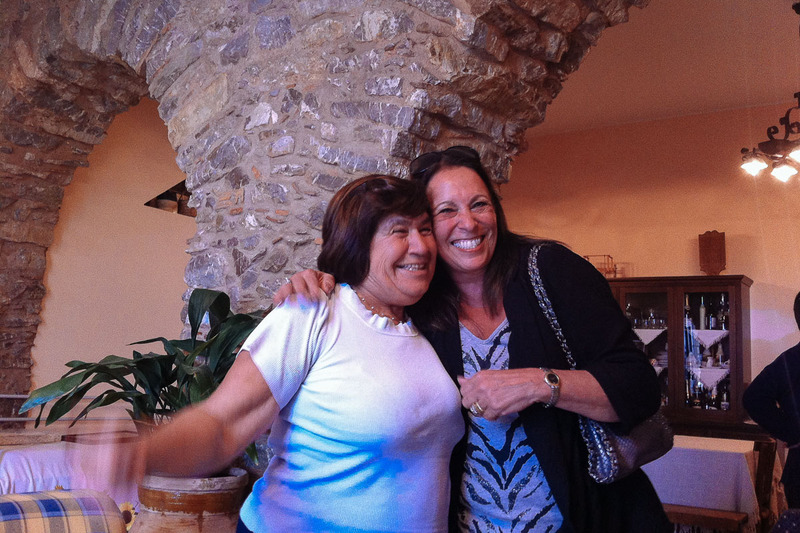 Long-lost relatives reunited in the homeland — Sicilia. We stayed a while, looking through family photos with Mrs. Amata, embracing every second. The time passed quickly, and it was getting late. Mrs. Amata asked if we could at least stay for dinner, but we knew we had to get back down the mountain before dark since we had been lucky to make it up alive in broad daylight. We exchanged many hugs and said our goodbyes, vowing some day to return when we would stay longer. We will keep that promise. As if the events of the day weren't enough, while walking back toward the café with Charlie, he bumped into a close friend of his named Antonino, who explained he had just moved back to Militello from Cleveland. He and my mother hit it off like old friends, and turns out they almost were: They went to the same high school. They compared stories about their teenage years and have stayed in touch since. It was time to go. We were so grateful to everyone for welcoming us to their town with open arms and for being so hospitable and interested in our mission. As we carefully drove back down the mountain, we were once again speechless, each of us quietly trying to make sense of what had just unraveled over the course of a few hours. While we were left with unknowns, we felt we had walked in as strangers and left as famiglia. We headed to Taormina on the Eastern border of Sicily, where we reveled in our experience for days. It really is all about the journey, exploring roots, making connections, and, of course, gathering stories you will tell for the rest of your life. My mother had dreamed that one day she would at least walk on the land of her ancestors. She got a lot more than expected that day. Sometimes you just have to go, call out a name and see what happens. You might be surprised. Lisa is the director of the TaletBank for FaithPopcorn's BrainReserve. She travels for exploration, intrigue, culture, finding distant relatives, and eventually, hopfully a beach.